Vitamin D Deficient | Your Health. Your Lifestyle. Can vitamin D help with the symptoms of multiple sclerosis (MS)? Will vitamin D supplementation delay the progression of MS in someone who has MS? Patients with multiple sclerosis are often vitamin D deficient. Since vitamin D deficiency causes muscle weakness, correcting their vitamin D deficiency significantly improves overall muscle function. If you have multiple sclerosis, there is no reason not to have your vitamin D status checked, be treated for your vitamin D deficiency, and prevent the recurrence of vitamin D deficiency. In milk to moderate cases of osteopenia (the prelude to osteoporosis), would taking adequate vitamin D and calcium be enough to prevent osteoporosis, thus eliminating need for osteoporosis medications? May men and women who present with milk or moderate osteopenia are vitamin D deficient and calcium deficient. It is recommended that the calcium be taken in two or three divided doses, rather than all at once, because it will be more bioavailable. The vitamin D can be taken any time. Does vitamin D have any association with scoliosis in adolescent girls? Can vitamin D supplementation help correct spinal curvature? It’s not aware of any association between scoliosis and vitamin D deficiency in adolescent girls. However, many adolescent girls are vitamin D deficient, and to maximize their bone health, they should be receiving an adequate amount of vitamin D and calcium. But vitamin D supplementation will not correct spinal curvature. Unfortunately, this is a permanent deformity. But if the vitamin D deficiency is exacerbating the spinal curvature, correcting vitamin D deficiency may help prevent further curvature from occurring. Keep in mind that vitamin D will also improve muscle strength; a study out of Lebanon showed that 2,000 IU a day to girls ten to seventeen years old did just that. Another recent study, which examined the influence of vitamin D levels on bone mass, bone turnover, and muscle strength in 301 healthy Chinese adolescent girls, also confirmed the importance of adequate vitamin D in reaching peak bone mass and muscle strength. Would the recommendation be the same for Down’s syndrome and intellectual disability patients? It is recommended that children over one year and adults receive at least 1,400 to 2,000 IU of vitamin D a day if they are not getting adequate exposure to sunlight. This also applies to patients with Down’s syndrome and with intellectual disabilities. I have primary hyperparathyroidism and my calcium is elevated and I am vitamin D deficient. My doctor says taking vitamin D will increase my calcium level and therefore I should avoid vitamin D. True? This is not true. Two studies have proved that, if anything, your parathyroid hormone and calcium levels will be improved by correcting the vitamin D deficiency. I have sarcoidosis and my doctor says I should not take vitamin D because it could cause my calcium to elevate above normal. True? It is true that excessive exposure to sunlight or taking too much vitamin D can cause the macrophages in the sarcoid tissue to make too much activated vitamin D. however, patients should not remain vitamin D deficient, because that can cause muscle weakness and symptoms of osteomalacia (aches and pains in bones and muscles). I have kidney disease and am on dialysis. My doctor said that since my kidneys cannot make activated vitamin D from 25-vitamin D, there is no need for me to take vitamin D to maintain my blood levels of 25-vitamin D above 30 nanograms per milliliter. Is this correct? No. the National Kidney Foundation recommend that all patients with kidney failure – even patients with no kidneys – should maintain 25-vitamin D levels of 30 to 100 nanograms per milliliter. What about people who have a vitamin D receptor (VDR) defect and need more vitamin D? Patients who have a VDR defect can sometimes benefit by increasing their vitamin D intake. It depends upon the severity of the alteration in the VDR gene. Patients with the VDR gene mutation known as vitamin D-resistant rickets or vitamin D-dependent rickets type II will sometimes benefit from being treated not only with vitamin D but also with the active form of vitamin D.
I take medications that make me extra sensitive to the sun. What should I do? If you cannot expose yourself to the sun for any amount of time, then supplementation is key. Ami to take 2,000 IU of vitamin D a day year-round. This can be in addition to any multivitamins containing vitamin D, vitamin D-fortified foods and beverages, and vitamin D-rich fish you consume. A lot of women are being given gabapentin for hot flashes instead of estrogen. Can it lower 25-vitamin D levels? It is not known that whether gabapentin (brand name Neurontin or Gabarone) used for treating hot flashes will lower 25-vitamin D levels. However, we do know that many drugs will enhance the destruction of vitamin D in the body. Thus, at a minimum taking at least 2,000 IU of vitamin D a day and having your blood level of 25-vitamin D monitored. The current recommendation of 400IU of vitamins D per day may not be enough to prevent vitamin D deficiency during the winter months. 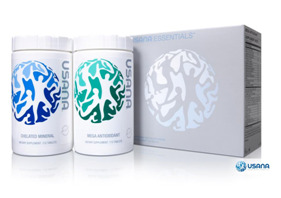 USANA’S supplement has 2000 IU of vitamin D per tablet.